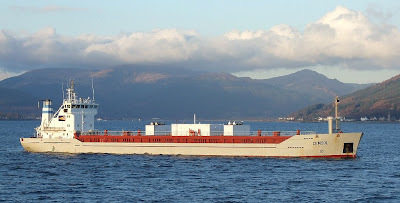 Two very similar ships have brought cargoes of cement to the Clyde since New Year. The first, CEMVALE arrived shortly before midnight on New Year's Day, while the second arrived at the 'Bravo' anchorage last night. She is named CEMSOL, and after spending the day at anchor, she headed up the river this evening. Launched in 1998 at Gdansk, and completed by a German shipyard as BARTEL, she was converted from a fairly typical small bulk carrier into a cement carrier earlier this year. Now owned by a German company but registered in Cyprus, CEMSOL has a deadweight of 4,850 tonnes and an overall length of 96 metres.